The Students for 60,000 club at Northport High School, which is dedicated to helping the homeless, is preparing to take its first service trip to West Virginia to work in some of the most impoverished, opioid-stricken communities in the United States. 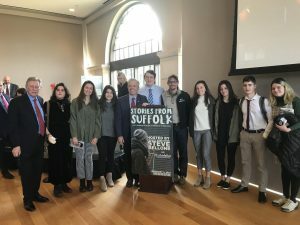 Before leaving for the trip during February break, students attended the County Executive’s forum on the opioid epidemic. Additionally, the club presented the work they have been doing for the homeless, as well as what they will be doing on their service trip. Students for 60,000 began in 1987 as a school club dedicated to assisting the homeless. The name of the club comes from the approximate number of 60,000 homeless in New York City at the time. Over the years, the club has turned into a program that organizes fundraisers that raise money and awareness for those in need. Photo caption: The Students for 60,000 club at Northport High School will be taking a service trip to West Virginia during February break, and in preparation attended the County Executive’s forum on the opioid epidemic on Feb. 6.